The RainyDayKitchen crew has been experimenting with sous vide cooking for the past several years. They have discovered that sous vide IS an amazing technique. It is practically foolproof, and so embarrassingly simple that to take credit for the outcome is almost bordering on fraud. The success of the sous vide technique has a lot to do with the precision cookers which are now available. The increasing popularity of sous vide is a result of the decreasing prices of those same cookers. 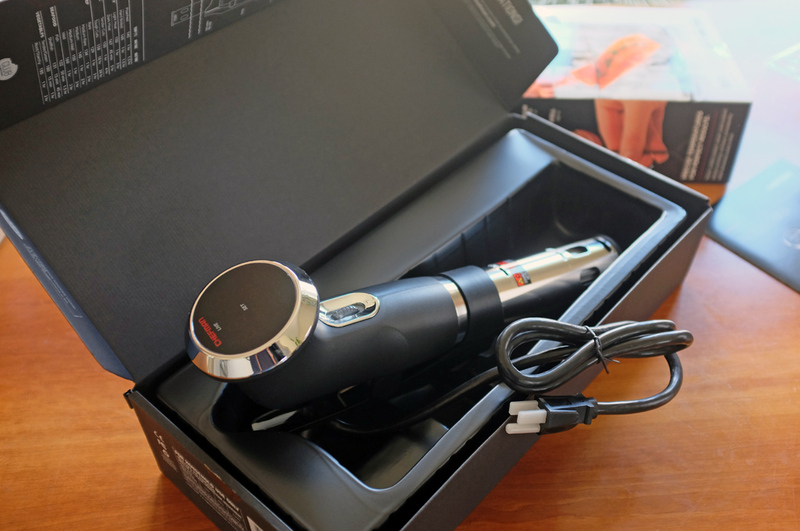 When we started using the sous vide method, a decent cooker/circulator was in the $300 range. Today, many sous vide cookers sell for well under $100. Intrigued by these more affordable newcomers, we are taking a FirstLook at one to see how they stack up to the pricer units. 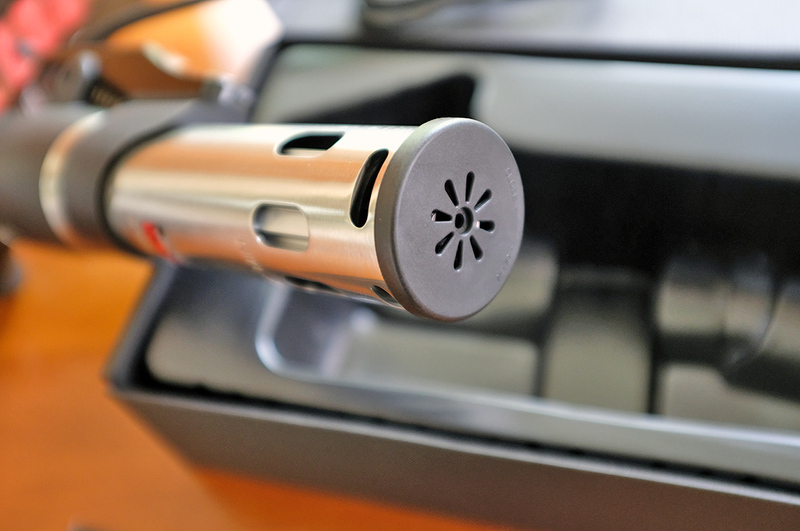 Sous vide cookers have been a Kickstarter darling for many years (Anova, Sansaire, etc.) We have reviewed the more popular ones (Anova, Sansaire) and have used a number of others. These devices are a great addition the RainyDayKitchen, but we always wished that the cooker-circulators were more affordable. 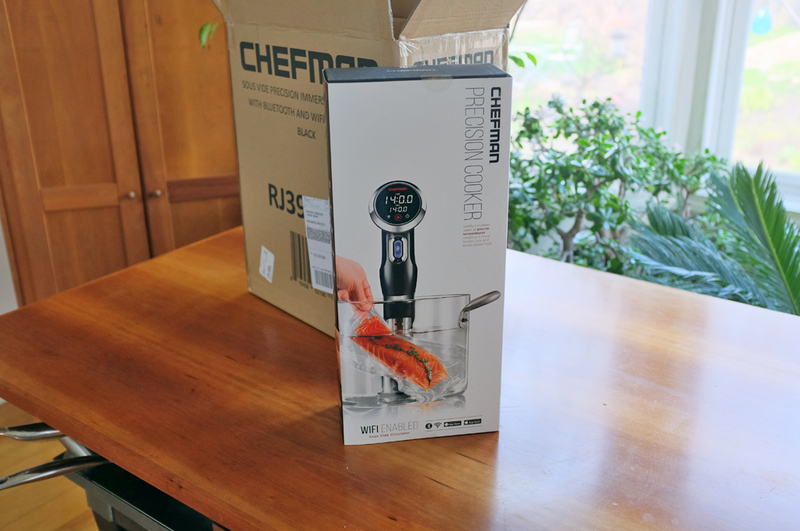 When a reader pointed us to the Chefman and asked if the $60 unit can run with the ones costing 3x more, we thought it would be useful to find out. 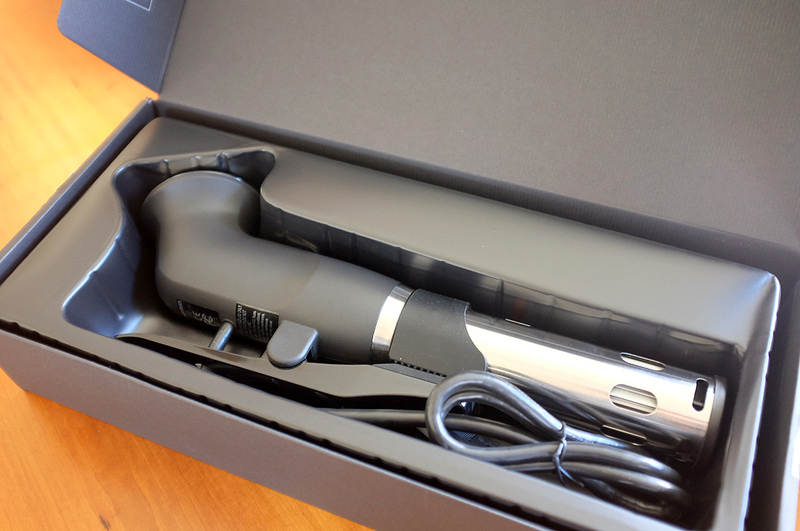 An instruction booklet contains the basics (operations, cleaning, cooking temps, etc). All other more detailed info (setup, recipes, etc) is on the Club Chefman site. 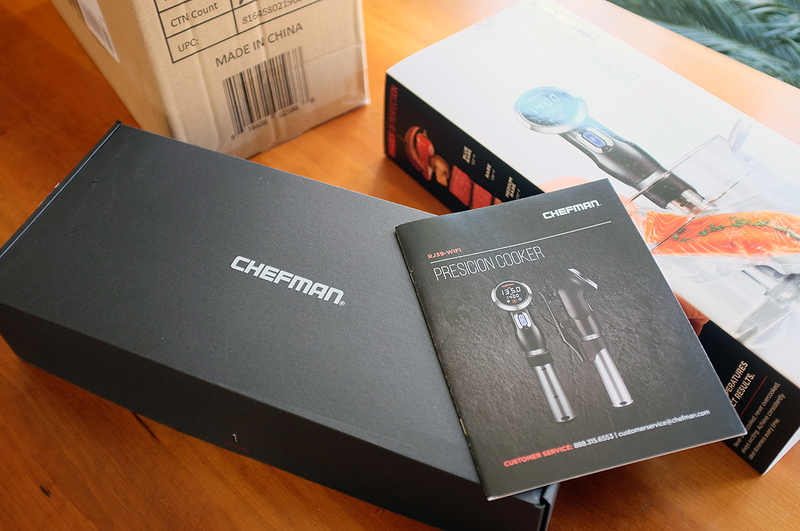 The Chefman cooker has a poly carbonate shell and a stainless steel shaft. The cooker comes assembled and ready for use. As far as we can tell, there are no removable parts. 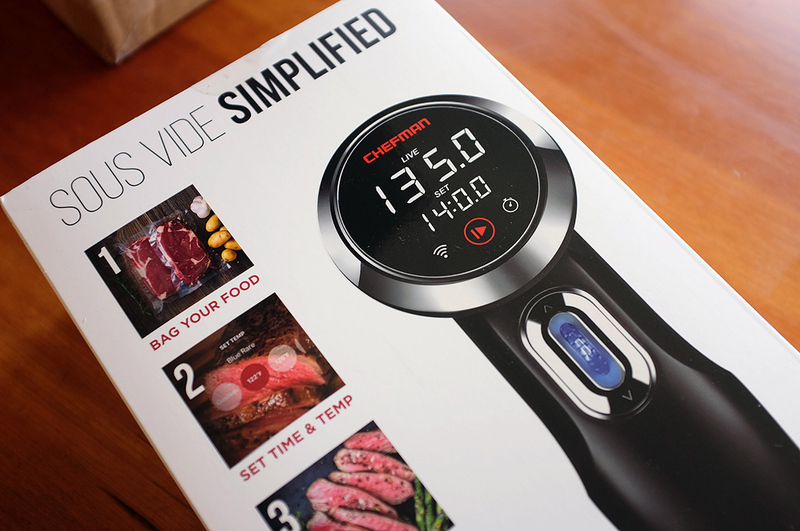 The display and control setup of the Chefman is very much like that of the Anova unit: circular LED info display, rotating dial in the handle to set time/temp. 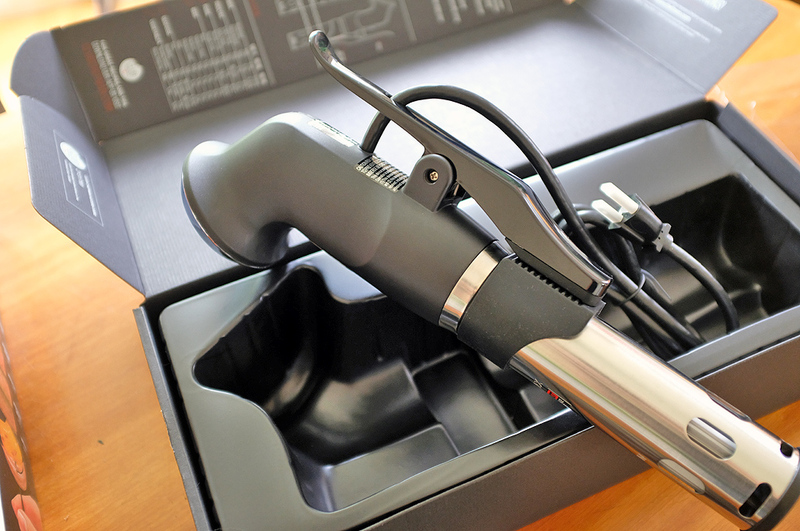 The heating element is covered by a stainless steel sleeve. On the sleeve are markings for the Max/Min water levels. Integrated to the body of the handle is the spring clamp for mounting the cooker-circulator to any straight-side pot or water container. The clamp is like that used on the Sansaire unit, in that cannot not be moved up or down the the shaft. This means the container used with the cooker needs to be at least 6″ deep. The Chefman unit looks very well-made and has a solid and substantial feel. While the clamp of the Chefman is not adjustable like that of the Anova unit, a non-adjustable clamp has never been an issue with us, and we do not expect that to change when we put this unit through its paces. Look for the results of the FirstUse before the end of the Summer.